It’s no secret that the Zelda series has been home to some of the most iconic video game songs of all time. For over 30 years, the music of The Legend of Zelda has set the standard for compositions that can simultaneously get stuck in a player’s head, set the proper mood, and allow for hundreds of different remixes and reinterpretations. But even with a bar set that high, even with many tracks sitting on the most positive side of the spectrum, there are realistically a few songs that don’t measure up to the rest. Please join us as we countdown the worst songs from the Zelda series, and lament the few shoddy pieces that offset its otherwise impeccable musical record. Note: Not all songs on this list are necessarily bad, especially given each person’s individual taste. But for every list of best songs, there must be a group of the worst. The tracks and list order were determined with the input of various Zelda players as to make this article as objective as possible. We begin our list with a song from the oft-overlooked GameCube title Four Swords Adventure. Crafting a good battle tune can be very challenging. One must compose a track that adds the right degree of tension to a certain encounter, as well as ensures that it doesn’t overstay its welcome during a lengthy battle or a number of smaller ones. “Minor Battle” doesn’t quite meet all of these requirements. The song does find the feeling of tension necessary to drive players during an important fight, and it makes its best attempt to keep to the background. But its frenetic pace and short duration ensure that it will get on at least a few players’ nerves before the game is over, especially considering that they’ll hear this tune during several mini-boss fights throughout their adventure. Loud and chaotic, this 16-bit “Flight of the Bumblebee” isn’t the series’ best in terms of battle music. 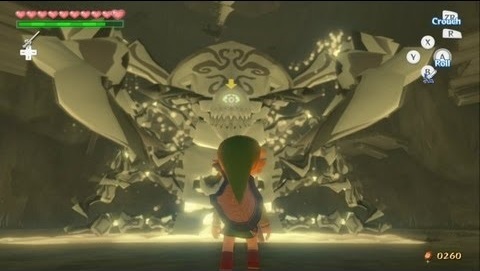 Before the climactic battle with Ganon at the end of The Wind Waker, Link must first re-live a few of the treacherous boss encounters he had overcome earlier in his adventure. Ganon’s Tower seems to draw upon and distort our hero’s memories, creating an unsettling, Bizarro environment for him to fight in. Visually, these boss rematches are extremely effective, with the action portrayed in blurred black and white. Audibly, however, they are a bit hit and miss. The iconic themes of The Wind Waker‘s four main bosses are themselves distorted to sell the unease of the scenario. But where the tweaked themes of Jalhalla and Molgera effectively subvert the player’s impressions of past battles with sinister sounds, Gohma’s unfortunately misses the mark. Slow, high-pitched notes blare as the song begins, making the composition sound more silly than scary. The song then transitions into a collection of poorly executed percussion samples, exhibiting the shortcomings of the GameCube’s sound capabilities. If Nintendo wasn’t already thinking about moving from samples to live instruments, this tune may have sparked that conversation. While this track is clearly attempting to deliver a specific atmosphere, it doesn’t quite live up to the twisted nature of its boss fight. It doesn’t even stand up to the other songs of its kind. This track is more of a tragic victim of its hardware than anything else. A moody and mysterious tune, “Dream Shrine Chamber” is actually a very well-made composition. It has all the elements it needs to be a great Zelda dungeon theme. So where on earth did it go wrong? Well, maybe the composers were a bit too ambitious, because the Game Boy hardware clearly wasn’t fit to play such high-pitched notes and flourishes. Outside of the context of the game, any person I have played this for has described it as ear-piercing and uncomfortable. And let’s be honest; it’s border-line unlistenable at high volumes. Much like its 8-Bit cousins, the Game Boy has a limited range when it comes to music. And “Dream Shrine Chamber,” as well-crafted as it is, lies just beyond that threshold. It’s a good thing that talented Zelda fans have since re-arranged this tune with the orchestral sounds that it deserves. This entry is an interesting case. Personally, I find this track to be fundamentally unlistenable, especially in its opening seconds. A cacophony of grating notes — those only a Game Boy could produce — assault the eardrums with unrelenting force, only to transition into a fairly sub-par dungeon theme. Then, with little warning, the song loops once more, surprising its listeners with another blast of unholy noise. I’ve heard floppy drives make better music than this. But here comes the interesting part: many listeners do not share my disdain. They may not be quick to call this an artful composition, but fans in the YouTube comments have expressed appreciation for this song’s intensity and creepy tone. Those are the essential elements for a proper Zelda dungeon theme, I can concede. Other defenders of this tune have only gone as far as to say that it “isn’t that bad,” only overstepping its boundaries for five seconds of a 30 second loop. You take compliments where you can get ’em, right? I still strongly believe that this song deserves a place on this list. But with the support it has received by a section of the fanbase, it will stay perched at the more positive side of the top 10. And so Link’s Awakening continues to disappoint, as we shift our focus from a buzzing dungeon theme to a pitiful cutscene piece. “Grim Creeper Returns” acts as a small, incidental track that plays directly before the boss fight of Eagle Tower. The mischievous Grim Creeper confronts Link at the peak of the tower, shouting threats before jumping on the back of a giant bird. The fight music itself is a solid Zelda boss song, but this ditty that plays directly before the encounter is much less impressive. So offensive in its mediocrity, “Grim Creeper Returns” doesn’t seem to accomplish what the scene requires. It’s too dull to effectively create suspense, and it’s too indistinct to spark surprise. It doesn’t even try to be goofy despite the cartoonish nature of Grim Creeper himself. Not to mention, the tedium of its five-second loop will ensure that players are sick of the song even before the short cutscene wraps itself up. 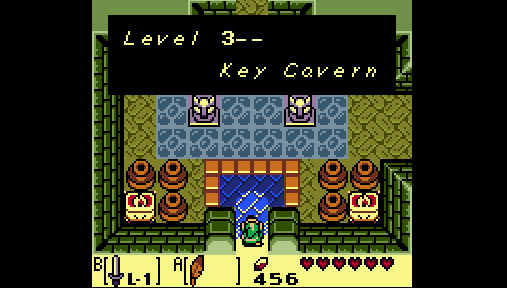 I think players give “Key Cavern” a pass for taking risks when establishing its mood. That same concession cannot be granted to this abominably bland effort. 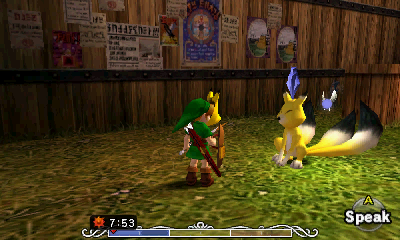 Throughout his adventures in Termina, Link may come face to face with mysterious fox-like creatures known as Keatons. These adorable critters have quite a fondness for riddles, and our hero can earn himself a Piece of Heart by participating in a mind-bending Keaton Quiz. With all that in mind, the game’s composers had few options when crafting a song meant to accompany this unique side-quest. They could have perhaps highlighted the mythical and mischievous nature of the Keaton race, or maybe built up a degree of tension as Link overcomes an important challenge of wit. It really is too bad the final product didn’t accomplish either task. “Keaton’s Quiz” is neither a quirky tune representative of the Keatons, nor is it all that tense. In fact, many have found it to be pretty annoying. The song itself even sounds unsure of where it wants to go, with all the strange pitch shifts and note changes sprinkled throughout. It just sounds like it’s slowly teetering off the side of a cliff. Granted, I do feel that this song is about four steps away from securing some kind of mood. The percussion samples add some sense of Old World spirituality, but beyond that, the composition never comes together as a cohesive work. Characters as intriguing as the Keatons deserve a much more developed theme tune than what they got. It’s time to shift our focus to a game that may become too familiar by the time we complete this list. Oracle of Ages does have its own share of great music. The themes of Lynna City, Tokay Island, and Mermaid Cave are all stand-out Zelda songs; but for every excellent tune in this title, there unfortunately exists another that drops the ball. “Ancient Tomb” commits many of the same sins as other songs on this list. For one, it loops after an egregiously short amount of time. With only a 25 second running time, this song is sure to get on the nerves of even the most patient Zelda fan. Even if the tune doesn’t bother a player right away, after a few minutes traversing the dungeon, it will feel as if though it has spitefully overstayed its welcome. The tune gets even less leeway from players — such as myself — who aren’t at all taken with the composition as a whole. The primary melody that repeats throughout the song falls completely flat from the offset. In fact, it even resembles some kind of playground taunt, as if the song is chanting, “neener, neener,” over and over again. It also does not help that the Game Boy hardware once again under-performs. The 8-bit drone of the handheld takes a merely annoying tune and makes it unapologetically offensive. We now officially turn to the truly vile tracks mucking up Zelda‘s musical portfolio, as we examine another curious dungeon theme from Oracle of Ages. I’m going to go out on a limb and say that “Crown Dungeon” is aiming for a similar sound to the iconic Death Mountain theme from The Legend of the Zelda on NES. Especially in the latter half the 37 second loop, one can hear an attempt to create a chilling refrain similar to that classic tune. But the song taken in its entirety — from its opening flurry of notes to a frustrating series of false starts — can be best described as… It’s just…It’s so bad, okay! From the very beginning, this track is a confused mess. The opening collection of notes only seems to make sense to a human ear if we somehow learn that they were chosen at random. They sound as if a toddler was banging its small hands across a keyboard for the very first time, smashing on a discordant combination of keys with no rhyme or reason. And just when you think that the tune is going to transition into something more palatable, it repeats the cacophony once again. As stated above, I find only the last 7 seconds of a given loop to be the least bit tolerable. 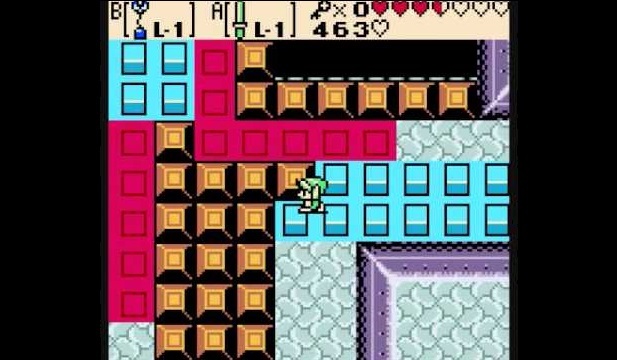 It is quite humorous to note that several fans in the YouTube comments found this track to be successful only in that it makes traversing a Zelda dungeon a painful and frustrating experience. I suppose one would express those feelings while exploring a subterranean labyrinth. But not many will come to defend “Crown Dungeon” beyond that sentiment, not that anyone reasonably would. Tri Force Heroes stands out as being one of the few multiplayer games in the Zelda series. Taking advantage of all the advancements of 3DS connectivity, this portable title lets fans quest together through the ever-handy “Download Play.” A single Zelda fan with TFH can invite friends into his or her session, even if those friends don’t have their own copy of the game. However, Download Play does have a bit of a side-effect on the soundtrack of Tri Force Heroes. While players with the TFH cartridge can enjoy the game’s pleasant tunes in the highest quality, those using Download Play only have access to 8-bit versions of each song. 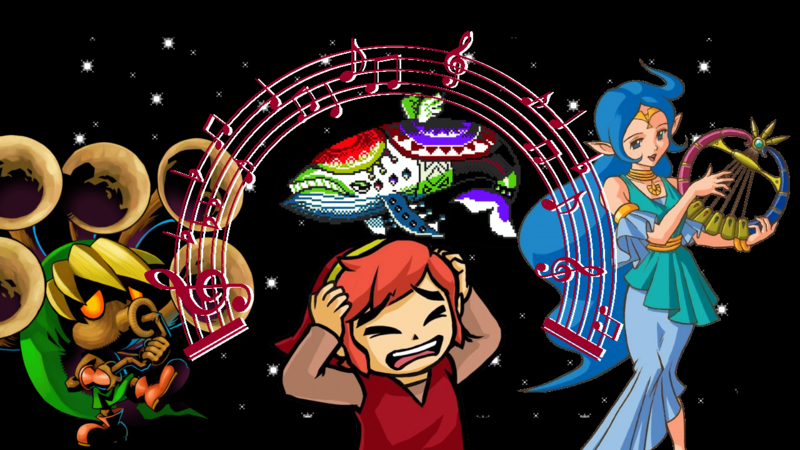 Basically, Tri Force Heroes houses a humongous soundtrack because of these 8-bit rearrangements, and for the most part, the composers did a great job translating each theme into a more retro style. A notable exception comes in the form of this quaint, little cutscene song. “The Convicted Princess” as heard in the main game acts as a suspenseful piece for the opening moments of the game, as Princess Styla locks herself away in her room after being cursed by the villainous Lady Maud. Sinister string sounds play an elongated note, occasionally accented by thundering drums. Though simple, this song effectively achieves its desired mood. The 8-bit version is not as effective. Rather than strings creeping along to deliver a dramatic moment, the NES sounds of old are only capable of producing a single dull note with the all the tension of a wet fart. It legitimately sounds like a dial tone occasionally interrupted by a sprinkler head. I suppose the only drama created by this pitiful piece would come when a player fears that his or her 3DS speakers are broken. Demonstrating the clearest form of monotony, this non-song exhibits the very real pitfalls of 8-bit rearrangements. The brown note of Zelda music, “The Convicted Princess (8-Bit)” is unquestionably among the worst of the worst. What makes this piece worse than the other songs we saw on this list? 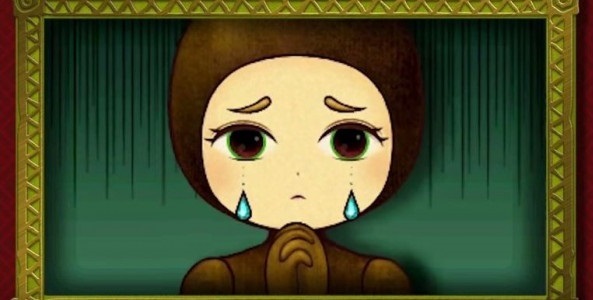 Well, where the other songs were striving for a serious mood (dungeon themes, tense cutscenes, battle music); this tune fails spectacularly at executing a happy and up-beat forest theme. And as annoying as a bad dungeon or battle track can be, there is something so much more aggravating about a failed piece of music meant for a cheerful area devoid of danger. The other songs had the benefit of contributing — perhaps not by design — to a stressful situation; this track bares every burden of those songs but with the added penalty of representing something antithetical to those failings. A friendly forest theme, especially a good one, should never be irritating to the player. Just think about the great examples of forest music in Zelda‘s past: the themes of the Lost Woods, Kokiri Forest, and Faron Woods. Each one illustrates an amount of effort, a cue of direction and intent. “Fairies’ Woods” is a lazy attempt to reach the places those songs so masterfully attained, settling for lame circus music instead of a great fantasy arrangement fitting of the series. The pantheon of Zelda music deserves so much more than this trite. This is a tune more fitted for a Chinese bootleg game starring Super Mario and Fred Flintstone. Of course, this song also gets more irritating and painful to hear the longer it plays. With just 15 seconds looping endlessly, I dare anyone to listen to this track longer than a few minutes. I know I can’t tolerate that amount of torment. This affliction is made that much worse by the in-game event that takes place in these woods. Link is forced hunt down three trickster-ish fairies deep within the magical forest. Finding them under rocks or in bushes would be laborious enough, but navigating the circuitous, ever-changing woods can make this diversion an agonizing experience. A visit to Fairies’ Woods may be short for some lucky players, but anyone spending more than few minutes in this wooded mire of misery will want to pull their hair out. And the insufferable theme music perhaps most contributes to a player’s frustrations. So there you have it: the worst offenses in Zelda music, the most unfortunate missteps in a series beloved for its soundtracks. If you disagree with any tracks on this list or you think another tune more deserves a spot, let us know in the comments!